The pictures in my thumbnails view are to small. Can I have bigger thumbnails too? Yes, you can select the thumbnail size clicking the small button next to the Thumbnails view button. Usually I use just two sizes for thumbnails. How can I switch between them quickly? You can define keyboard shortcuts for them, to switch between these views easily. In the main menu go to “Tools → Define keyboard shortcuts…”, then find (or filter) Thumbnails items (“View” section) and assign a shortcut to those you like. I would like to see the thumbnails for my text files too? Is it possible? 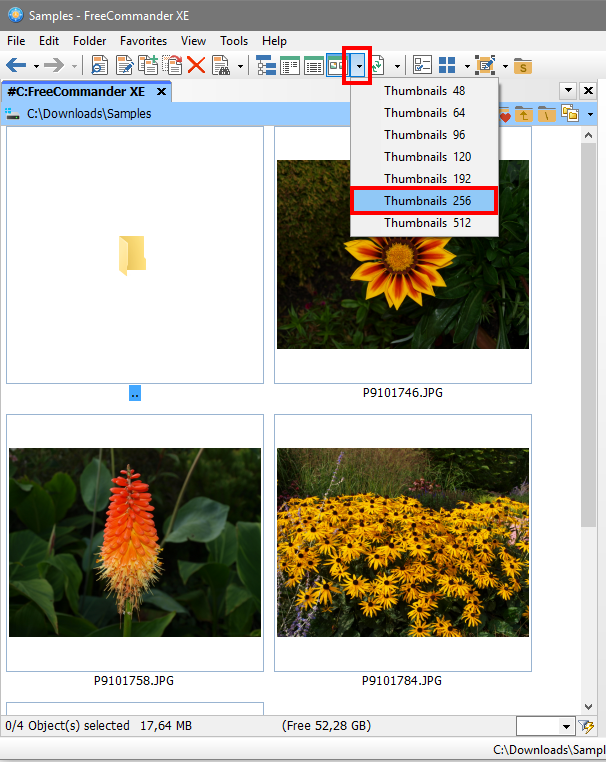 Yes, open the “Settings (F12) → View → Thumbnails” and enter the file extensions for the text files within the field below “Make thumbnails for the text files”. I use SVN client on my PC for showing special overlay icons but for thumbnails view I do not like the overlay icons. Can I disable the overlay icons for thumbnail view only? Yes, you can, go to “Settings (F12) → View → Thumbnails” and unselect the option “Show overlay icons”. I would like another background color for the thumbnails, how to change it? 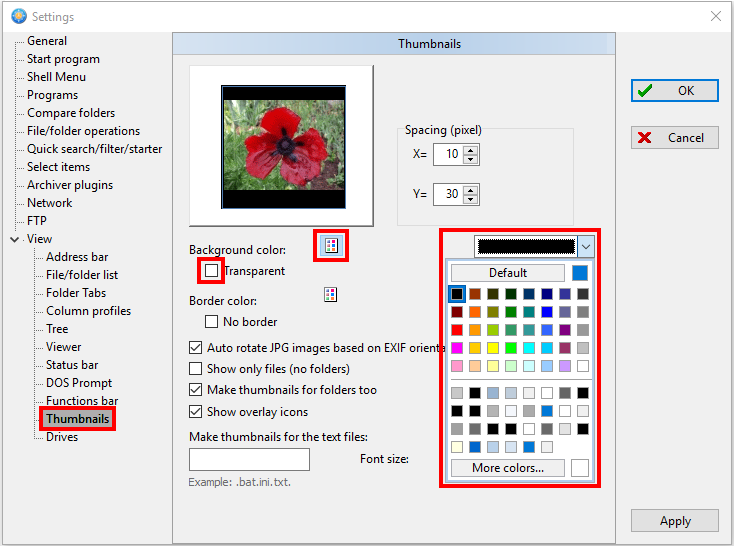 Open the “Settings (F12) → View → Thumbnails” then unselect the option “Transparent” below “Background color:” and click the color button to change the color.